Modern “science” and recent “research” suggests that wild grains have been consumed in various forms as early as 30,000+ years ago. When it comes to bread, we know that the Egyptians were making bread 2500 years ago. So I offer up a question. Why is bread now being demonized as a catalyst for so many chronic health conditions? Is there something inherently wrong with bread that only recently we have discovered? Gluten, wheat and bread are now being looked at with the same vitriole as saturated fat a few decades ago. I believe we will find, as with saturated fat, that there is more to the story. The answer is not nearly as black and white as we have been led to believe. I dare say that bread can play an active role in not just the creation of health but also the maintenance of health. There is one disclaimer. When I refer to bread, I am referring to real bread not the garbage sold in every grocery store, most farmers markets and served in just about every restaurant. An example of the real bread I am referring to is what Mark Doberenz, owner of Green Lion Breads and baking artist, is hand-crafting in Phoenixville, PA and selling locally. With the above being said, when it comes to food, there is NO one real whole food that is good for everyone. There is also, NO one real whole food that is bad for everyone. The reason is biochemical individuality. Everyone’s metabolism is unique. While we all have the same metabolic pathways, they are all functioning a varying levels of efficiency as determined by your health potential, the environment in which you live and the lifestyle choices you have made within that environment over the course of your life. Failure to understand this concept makes health building challenging and a long process of trial and error often resulting in failure, frustration and even self-loathing. Before we look at who should not consume breads and why, let’s first consider what real bread is. Heritage, Heirloom or Ancient grains: I feel comfortable saying that breads consumed in America today are made with modern grains. Modern grains have been manipulated through science to express specific traits. This trait expression has little to do with supporting the health of the consumer. Agribusiness is more concerned with boosting output, maximizing profitability and making them more resistant to disease and chemical pesticides. In order to do this they sacrifice nutrition, flavor and digestibility. These grains have become a commodity, to be bought and sold, like oil, or steel. Science is not all bad. While modern grains are frowned upon, we do have very talented individuals working on a type of breeding by stemming heirlooms. The result is flavorful, nutritious and very growable in our geographical region. Examples would be Warthog and Redeemer wheat. While they are modern in the science and tech, they are designed from a health perspective. I can say from experience both Warthog and Redeemer make a very tasty bread when in the hands of a competent baker. We can also look to the past and use ancient grains naturally provided by mother nature. Einkorn is one example of an ancient grain which has the digestibility of a vegetable but still contains high amounts of protein and other nutrients. When we consider gluten, this is an area of much debate. The problem is that science is still lacking enough information from quality studies. Much of what we are told is anecdotal. One scientific observation to mention is that Einkorn having 14 chromosome has a different gluten structure than that of modern wheat having 42 chromosomes. Recent research is showing that the Einkorn gluten does not have the same effects in the body as modern gluten. Is this why we are seeing elevated incidences of gluten intolerance, auto-immune conditions and other highly correlated conditions? Honestly I don’t know, but I do believe it is part of the puzzle, and needs to be considered. At the very least, we know that modern grain bears little resemblance to earlier grains outside of physical appearance. Stone Ground: Grains were originally ground or milled by hand typically between two stones. There was enough pressure to break up the grain and separate its layers but not so much to generate heat or excessive pressure that would harm the nutrients. This technique of using stone milling is still available in certain locations. Modern practices are all about speed and efficiency which also brings with it heat and pressure that degrades the nutritional profile. 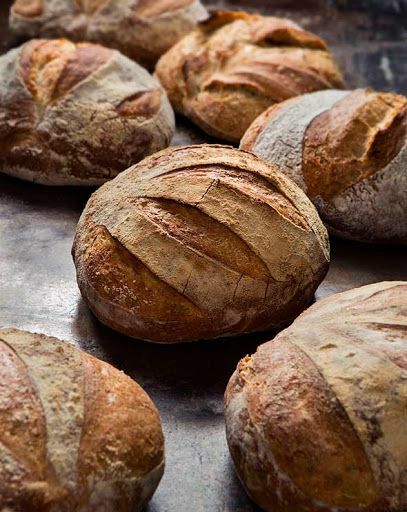 Naturally Leavened: When most individuals think of baking bread they rely on recipes that include quick-rise yeast. This commercial yeast is designed to allow the dough to rise quickly and bypasses the benefits of natural leavening or fermentation. Yeast makes it easy to produce bread but that ease has consequences. The purpose of bread fermentation is to transform the various nutrients freed by the milling to modify them for optimal digestion and absorption. Natural leaven uses wild yeast or the natural air-borne ferments that are seeded in the dough left exposed to specific conditions of moisture and temperature. Wild yeast naturally enriches the bread. Traditional baking methods also can utilize a starter or remnant from the previous batch of dough to be catalyst or primer for the next batch of dough. Some bakers have starters that go back over 100 years. In a nutshell, modern grains and modern milling and dough production creates what is essentially a nutrient deficient, hard to digest processed food. Modern bread is not food, it is a food replacement without any real benefit other than one of convenience. Ignore all the “artisan” breads being sold. “Artisan” is merely a marketing tool to make you believe it is more than it really is. Just because someone in the “baking” department of your local grocery store removed frozen dough from the freezer then hand-rolled it into a shape before sticking it in the oven does not mean it’s an artisan product. It is all smoke and mirrors. When is bread consumption a bad practice? First, no one should be consuming modern bread as it is not real food. If you do, make it organic to reduce exposure to toxins and try to keep intake to a minimum. Harm from modern breads and from toxins, in general, is cumulative unless you have a specific health condition. If you have a diagnosed celiac condition, don’t eat any bread, real or not, just don’t. In addition, your gut is most likely dysfunction, it would be very helpful to investigate functionally and devote attention to healing the body. If you are diagnosed gluten intolerant, you may be able to handle real breads in small amounts periodically. As with celiac, look inward and take advantage of healing opportunities. If you suspect you have gluten intolerance, see above. With regards to gluten intolerance, it is important to realize that modern grains, except organic, are almost all sprayed or exposed to chemical pesticides just prior to harvest. They do this to prevent or at least reduce the growth of molds while the grains are in storage. It is possible that you don’t have a gluten issue, rather you’re having a response to the molds and/or to the chemicals themselves. In this situation, find real bread and experiment. See how your body reacts. There are many gluten free breads available. Many of these are garbage. They are not real food as the ingredients used to replace gluten/wheat may be as harmful if not worse and contribute to other health conditions. I know of many individuals going gluten free and screwing up their ability to manage blood sugar for instance. Plus, most of the gluten free products are not very enjoyable relative to the real thing (at least from my experience). Processed is processed regardless of it being organic or what fancy marketing terms are used. If you have performed a food sensitivity blood test and prove reactive to specific grains, don’t consume those grains. If you test reactive to multiple grains I would suggest you stay from all of them and work on gut health. Realize that these tests only test modern grains. If you have an autoimmune condition avoid gluten. Gluten has been highly correlated with making things worse, especially with Hashimoto’s disease. Hashimoto’s is a thyroid condition often not tested for, yet is the underlying catalyst for many hypo-thyroid conditions. If you have an autoimmune condition, gut dysfunction is present and grains in general can be very hard to digest and irritating to the body. What is this “gut health” I am referring to? If you have or think you have any of the above challenges, please consider that you have some degree of mucosal barrier breakdown. For those not familiar with increased mucosal permeability or “leaky gut,” think of your digestive system as a tube running through your body. Until something has passed through the lining of this tube it is not actually inside you, it has not been absorbed to enter into general circulation. When functioning properly, this barrier allows “good stuff” in while keeping “bad stuff” out. When compromised, the opposite takes place. Not only is the permeability altered but so is the terrain or internal environment which greatly alters your micro biome or the health/balance of the bacteria residing in our gut. It is very hard to have a healthy symbiotic relationship with harmful bacteria. If you have “leaky gut” the immune system is designed to recognize “ bad stuff” (antigens) that does not belong. The immune system is supposed to attack and eliminate the antigen ultimately removing it from circulation and then from the body itself through detoxification. This immune process is a a significant stressor and source of inflammation. If not correctly dealt with properly or effectively, a cascade of events can be triggered leading to any number of additional health conditions. Step One: eliminate exposure to food antigens and do so for at least 3 months if not 6 months, before re-introducing and testing your body. While step one should, at least, minimize symptoms it is often not enough. The reason is that the damage is often too severe and the true underlying problem has not been resolved. Rarely is the food the problem. The food sensitivity is merely a symptom. The odds of finding a 100% correlation between cause and effect is unlikely, as there is too much metabolic variability among groups of people even with similar symptoms/diagnosis. Step Two is to investigate what has contributed to the compromised mucosal barrier at a causal level. Most common catalysts for “leaky gut” include antibiotic usage, pharmaceuticals, pathogenic infestations/infections, chemical/toxin/heavy metal exposure, fake food consumption and chronic stress. Until you correct the gut, you will most likely continue to struggle with health problems. To accomplish step two, assessing the functional capacity of various metabolic pathways is encouraged. Rarely is the cause due to one specific independent pathway. More likely there exists multiple healing opportunities that will greatly influence not only how well the body functions but also how good you look and feel. As an FDN® Practitioner, investigating the underlying causal factors is part of what I do, along with correcting the metabolic disturbances through environmental, lifestyle and behavioral changes. If would like to discuss how this process of healing works, contact me for a consultation. If you want to get your health back, there is no better time than the present to get started.